This weeks challenge is considered a technical challenge and is called SOOC, which stands for Straight Out Of the Camera. This means no post editing of any sort what so ever. I’m truly an amature photographer and I need as much help as I can get. This means no post editing may produce a garbage image, especially when I’m accustomed to the help. This is really due to the lack of experience with focal lengths, ISO, and camera functionality. I usually use post editing pretty heavily to get a specific look or feeling in an image that I was unable to achieve with the original image out of the camera. Some may consider the use of these tools a crutch, but I consider it just another tool. Let’s not get confused here, I’m not talking about Instagram filters, although I have used those as well, but you can get carried away pretty fast with those. You can make an okay image look amazing with post production editing via Photoshop with highlights, contrast, and many other variables that deal with the images data. The lack of these tools would have made the challenge difficult for me if it were not for one of our damn dogs. 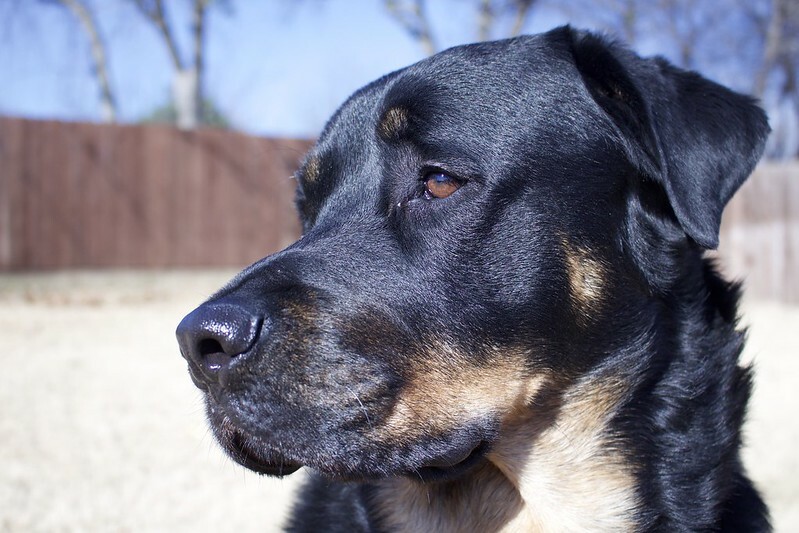 Cooper, also known as “Coopies”, is a 2-year-old AKC Rottweiler. He’s also a total train wreck in regards to veterinary bills. Cooper was the first pet we’ve ever purchased. We usually would rescue animals into our home from shelters or off the street. I couldn’t tell you exactly why we decided to purchase Cooper other than we had some concerns and thought that getting a full blooded certified AKC breed would not have genetic disorders. Yeah, that worked out real well for us as you’re about to see. At the young age of 9 months, Cooper started to develop duck feet. I don’t mean webbed feet, I mean his paws were pointed outward in a “V” shape. We also noticed he would start to limp periodically and whimpered every now and then when chasing his brother Jackson. Jackson is a 5-year-old Black Lab mutt, and is also healthy as a horse. Coopers’ symptoms progressively got worse and we had to take Cooper in to see the veterinarian. The prognosis was not good, our puppy would need surgery. Cooper was diagnosed with Elbow Dysplasia. Elbow Dysplasia in dogs is inherited and apparently pretty common among some breeds and was exactly what we were trying to avoid. The odd thing is, none of the other pups in the litter had Elbow Dysplasia. I guess, like usual, we had won the train wreck lotto, yay! Of course, after learning about Elbow Dysplasia and the cost of surgery, people chimed in with, “I’d put him down”, “why would you pay that for a dog”, and other nonsense. Fair enough, they may have had a point, but our pets are part of our family, so we dug up the funds and got Coopies all fixed up. The last year and a half have been great for Cooper. He loves to chase squirrels in the back yard that he’ll never catch in a million years. You know, dog stuff. We thought that the worst was behind us and Cooper could chill and be the awesome dog that he is. Everything was going swell until we came home from vacation two weeks ago. While we were away on vacation Cooper decided he was going to get those squirrels once and for all, because he apparently ran so hard that he tore his ACL. Yeah, that’s right, the dog tore his ACL. Seriously. Little did I know that this is apparently very common and a major income stream for orthopedic veterinarians. Since Cooper was severely limping and not getting any better, we took him to the veterinarian. The ACL tear was very quickly diagnosed and Cooper is now scheduled for surgery tomorrow, January 9th, 2017. This will be his second surgery, and from what his surgeon says, will most likely not be his last. 50% of all dogs who have torn one ACL will tear the other one. Awesome. This brings me back to the 52 Week Photography Challenge and why I chose the below image as my week 2 photograph. The story. All of these challenges specifically say to tell a story. I understand that this is meant figuratively and that the story may indeed be in the eye of the beholder. The story I choose to see in this unedited photo is regret. A dog who looks back on that line of trees and says, I shouldn’t have gone so hard and so fast. Ha! The title of this image is Squirrels and ACL’s. **The above images were edited. The below image is SOOC. Posted on January 10, 2017 January 10, 2017 by btgaragePosted in PhotographyTagged #dogwood, #dogwood2017, #dogwoodweek2, Photography, photos.